Universal Personalised Care, published this week, follows the NHS Long Term and seeks to revolutionise the choice and control that people have over their health and care. At its centre is our Comprehensive Model, bringing together six evidenced-based interventions so personalised care can be implemented at scale across the health system. From the very beginning, the model was built through coproduction with a wide array of partners. We worked with communities and individuals with lived experience right across the country to discover what matters to them, what works and doesn’t work, and how the individual components should be implemented. Partners from local government, big and small voluntary sector organisations, and bodies that represent clinicians and professionals have also been centrally involved. The model represents a bottom up drive to create opportunities for health that places people and communities at its heart, while tapping into the great work that is already happening and the resulting evidence base. Starting with people and communities is a key part of how we will need to implement the model. The focus for individuals is the question ‘what matters to you’, not just ‘what’s wrong’. When local areas begin to adopt the model, asking ‘what matters to us’ is essential. However, to enable adoption across the whole country, we must take this bottom up creation and frame it clearly and simply. That’s why we have set out 21 actions to ensure everyone can benefit from the learning process that others have been through. We have created standard operating models and common frameworks – not because we want to impose a top down, one-size-fits-all approach, but because we want to ensure that the ‘bottom up’ gains the traction it deserves. Take Social Prescribing for example, one of the six components of the model. Some have argued that this, and the recruitment of 1,000 link workers, is an example of the NHS encroaching into space that should be filled by communities. They worry the language is over medicalised, and ask why people need to be connected to community activities by GPs. One answer is that for many people, GPs are their most familiar contact in their communities. They know the GP is there and available to them – so we are going to where many people already go. We also know that at least one in five appointments with GPs are about issues that aren’t purely medical. Social prescribing is such a vital development because it explicitly recognises that what keeps us well isn’t just medical, but social as well. It’s also important to point out that social prescribing is offered alongside other medical treatment options for people who have physical or mental health conditions. People won’t lose the existing clinical support they need. Although one of the benefits of social prescribing is that often the symptoms improve sufficiently to require fewer clinical interventions. Universal personalised care recognises many link workers are already in close partnership with social workers, occupational therapists and other health and care professionals. There isn’t any intention to replicate or diminish their important work – only to strengthen the commitment to supporting people to connect to their community, to develop a plan based on ‘what matters to me’ with a trusted and skilled advisor towards activities that will help support their physical and mental health needs. My view is that we need the system and communities to come together. We need both the complexity of models and processes from the health and care system to ensure we distil the best outcomes we can; and to work alongside the innovative approaches that come from within communities so that these can spread to every part of the country. Universal Personalised Care is a solution built from the ground upwards, and our implementation plans will focus on continuing to work with people and communities to seek the most effective ways of making it work. Whilst language is important, the time has surely come to be getting on with delivering something together, based on the fantastic work already happening. This is an opportunity to embed personalised care that many people have been working for a long time to achieve. We, alongside many others, are seizing the moment, and working towards building the future many have long been advocating for. 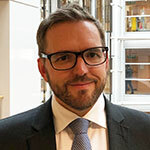 James Sanderson is the Director of Personalised Care at NHS England, working within the Strategy and Innovation Directorate to oversee the strategy and delivery for a range of programmes that are helping to empower people to have greater choice and control over their care. This includes the Personal Health Budgets programme, Integrated Personal Commissioning (IPC), Shared Decision Making, Person-Centred Care, Maternity Pioneers and developing and implementing new models of delivering patient choice. James joined NHS England in November 2015, and was formerly Chief Executive and Accounting Officer for the Independent Living Fund (ILF). The ILF was used to support disabled people across the whole of the UK to live independent lives through the provision of direct payments enabling the purchase of personal assistance support. After graduating, James embarked on a career in the private sector before joining the ILF in 2002 to undertake a number of senior roles including Operations Director with responsibility for front line service delivery, and Business Development Director with responsibility for performance development, change management and information governance.